April 03, 2008 by cakehouse in "Cakehouse", "celebrate Earth Day", "protect the environment", "re-use", "recycle", "recycling"
though i knew that i wanted to start my own business after graduating from design school, it took me a rather ridiculously long time to settle on what that business would be. i had studied textile design, so i knew i wanted to work in the fabric medium; then i figured out that i wanted to do home accessories, and to silkscreen. okay, good! but i couldn't get past that point. only when i realized that i should work with recycled fabric—incorporating my love of everything vintage and secondhand, and my ever-growing want to make my life greener—did my business really start to take solid shape. 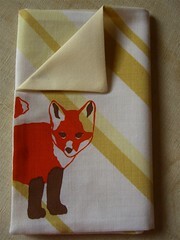 of course, i still had to decide on a product to launch with, so i upped the eco ante by choosing to make cloth napkins. i now make napkins and coasters, out of fabric that i find at thrift stores all over the city and sometimes beyond—whenever we go on vacation, i manage to work in a trip to the local thrift stores (there's a great website that makes this possible). i mostly work with bedsheets, curtains, tableclothes, and the occasional housecoat. 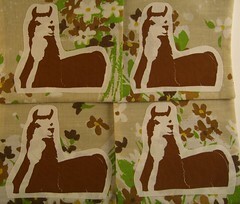 i cut them up, sew them back together, and print on them with nontoxic water-based inks. i try to keep with the green/recycling ethos at every level of cakehouse, not just in terms of the products themselves. i wash all my fabric in natural detergent, and dry it on the line in my backyard (9 months out of the year, anyway). my sewing machine is from 1965 (via ebay), my ironing board came from freecycle (and is possibly from before 1965...), my cutting and piecing table came from a family in my neighborhood that was giving it away. i just recycled some unwanted shutters into fantastic displays for when i sell at markets and fairs. not only is it great for the earth to re-use instead of buying new, but it really satisfies me on an aesthetic level to look around my studio and see things with a history, things with a little wear and therefore, i think, more personality. "Cakehouse", "celebrate Earth Day", "protect the environment", "re-use", "recycle", "recycling"